Are you shouldering all the burden of trying to get your organisation or company to take on better performance measurement practices? Stop the struggling today, and kick off a KPI Community of Practice to share the load. Here’s a framework for designing and initiating your KPI or Performance Measurement Community of Practice. Who should be part of your KPI Community of Practice? Members of the Corporate Strategy team. Business Unit Planning Officers currently responsible for developing operational and team plans and KPIs. Business or Reporting or IT Analysts who collate, analyse and report performance data for users. Influential managers or leaders who have a passion for evidence-based decision making and performance improvement. Process Improvement Officers, who lead projects aimed at improving business performance. Performance measurement really should be seen as a natural part of the work these people do, NOT as something extraneous to it. How many members should you have? Rather than worrying about having too few or too many people in your KPI Community of Practice, it’s more useful to aim to have one or two representatives from each business unit in your organisation. This means if you have 6 departments, and within these departments a total of 17 business units, you will have about 17 to 30 people in your Community of Practice. Of course, the larger the group, the more skilled you’ll need to be to facilitate them during their get-togethers. What’s the Charter for your KPI Community of Practice? There are two incredibly important reasons that a Community of Practice should exist for performance measurement. The first reason is to make sure there is a proven performance measurement methodology or approach that is used consistently organisation-wide. Much of the struggle people have with performance measurement boils down to not using an approach that works, or not using any kind of approach at all. The second reason is encourage buy-in and engagement from others, so that performance measurement is experienced as fun, focusing and fulfilling. The buy-in starts with the members of your KPI Community, and then grows infectiously through how they involve their colleagues. What exactly does a KPI Community of Practice do? First and foremost, the Community of Practice takes care of its members. It’s a forum for people who are desperately seeking better performance measures, but are feeling stuck or overwhelmed on their own. Being part of the Community of Practice reminds them they are not alone, and they don’t have to do it all themselves. So a big part of what the Community does is get together to share struggles and ideas, successes and learning. They will work together too, outside of the group get-togethers, to co-facilitate or review each other’s performance measurement activities. Review and improve the corporate performance measurement methodology and how it links to planning and improvement. Share new ideas, tips and tricks with each other that will make performance measurement implementation more fun, more meaningful, faster, easier, etc. 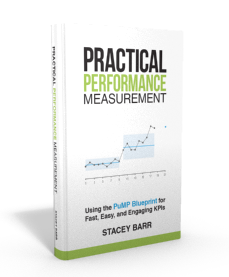 Create resources to teach better performance measurement practices to colleagues. Design methods to engage leaders and colleagues to make performance measurement a natural part of how they work. Assist Corporate Strategy with cascading new strategic directions. Research how others do performance measurement, and bring new ideas and learning back to the organisation. 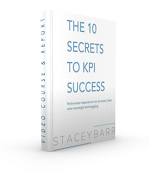 How will you know your KPI Community of Practice is a success? A great way to gauge the success of a KPI Community of Practice is to gauge the success of performance measurement in the organisation. You can do this by having your KPI Community of Practice start with a simple diagnosis of the current performance measurement system, and then take regular re-evaluations every six months or so. It wouldn’t hurt to ask members how their confidence and satisfaction with their own KPI activities are going too. What’s it going to take to set up your KPI Community of Practice? You will need a Community Leader, someone to initiate the idea, suggest how to get it started, and to continually inject in excitement, valuable suggestions and reminders of the shared purpose. The role of organising the members list, the regular get-togethers and other administrative things can of course be shared among members. You probably want to meet formally at least once a quarter, and ideally have informal interaction among members much more regularly than that. The bonding is important! And there’s no reason to start big: just start off with whoever is most keen, and let it grow organically from there. A great way to kick off your KPI Community of Practice is to induct all the members in a single approach to better performance measurement. If you make it in-house and tailored to your organisation, it will excite them, unite them, and help them hit the ground running to immediately start creating and using better performance measures.